Discover up-to-date Old Fourth Ward homes for sale & neighborhoods in Atlanta GA below! Old Fourth Ward: a diverse neighborhood that packs history into every nook and cranny; a place for world-class dining experiences, and trendy-meets-dingy bars; home to lavishly appointed public parks, weathered warehouses, bustling thoroughfares and quiet, tree-lined streets. One doesn’t like to rely on superlatives, but in O4W (as the locals call it), there’s actually something for everyone. Learn more information about Old Fourth Ward properties for sale in Atlanta or schedule a private showing by contacting your Old Fourth Ward real estate professionals today. 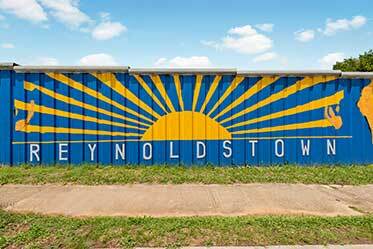 Searching for a home to buy in Old Fourth Ward? Contact your neighborhood real estate agents, The Keen Team, for professional help in the real estate market near Old Fourth Ward, Atlanta. Call us at (404) 270-9374 today! 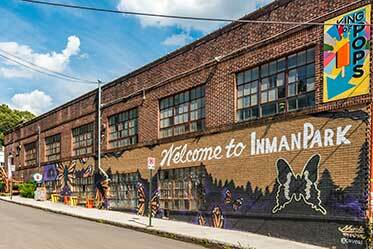 As intown Atlanta’s quintessential melting pot, Old Fourth Ward has been undergoing a metamorphosis spanning half a century. This convergence of experiences didn’t come overnight. O4W is old, yes: one of the oldest neighborhoods in the city, in fact. But as early as the ‘60s, when the first skyscrapers were being erected in neighboring Downtown, Atlantans saw the potential this humble community had, and began a process of urban evolution that stretches on, even today. The people who live here have come to appreciate the proud, eccentric bustle of this neighborhood. For better or for worse, there’s always something to do in O4W, and whether home is a converted loft, or a fully restored, post-Civil War Victorian, the energetic charm of old, close-as-you-can-get Atlanta is always hanging in the air. Old Fourth Ward is just about as close as one can get to the city. The northern border bucks up against the Ponce Corridor and the southwestern corner of O4W is lined by Freedom Parkway, which grants direct access to the Connector. Meanwhile, a number of surface streets lead straight into the heart of Atlanta, just a few minutes away. Find a rooftop restaurant, grab a cocktail, and watch the sun set. Old Fourth Ward is right next door to the Atlanta skyline, and the view of Downtown and Midtown as night falls is just spectacular. If the location of O4W fits your lifestyle, take your time while home hunting. This part of town is chock-full of historic homes, converted warehouses, park-front bungalows, sleek condos, new construction—you name it. Best to have an idea of what you want in advance so you don’t get overwhelmed. Take a ride on the streetcar. In the past, this mode of transportation was crucial to how Atlantans got to the eastern suburbs, and while the system was defunct for decades, a miniaturized version has been recreated, offering a convenient—and fun—way to get around the close-in parts of town. The Atlanta Public Schools system leaves a lot to be desired. There are some intown options, however, and access to the major roadways makes the commute to a private institution a bit easier if you’re weighing schooling options. Needless to say, traffic during peak hours gets more hairy the closer one gets to the middle of the city. Still, a network of large thoroughfares is woven throughout Old Fourth Ward, and if you plot your drive correctly, the traffic isn’t too bad. Major roads are North Avenue (to the north), Freedom Parkway (it runs through the middle of O4W), and Boulevard, which cuts through the middle of the area, running north to south. Direct access to the connector is available at the base of Freedom Parkway at Boulevard, so getting north and south is easy. I-20 is just a little farther south, and can be accessed from I-75/I-85 as well. There are two rail stops fairly close to O4W. King station, which runs east/west, isn’t the most accessible on foot, so most residents (especially in the northern end of the neighborhood) prefer to use the North Avenue stop, which runs north/south. Dr. Martin Luther King was born and raised in Old Fourth Ward. Today, visitors can visit the civil rights activist’s childhood home (it’s now a museum) at 501 Auburn Ave., before heading to the memorial constructed in his honor, just down the street. 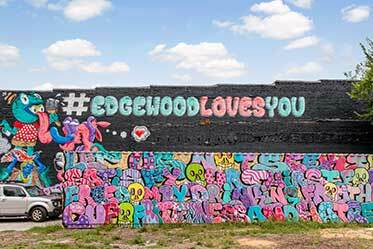 Located on the southern end of O4W, Edgewood Avenue has become the living embodiment of dingy dive bars, tucked-away eateries, and more eclectic street art than your camera can hold, making it one of the most popular zones for after-hours entertainment in the city. If you're considering a home in Old Fourth Ward, connect with our Atlanta real estate professionals for help with the ins and outs of local properties. Our Old Fourth Ward real estate agents have up-to-date knowledge on the unique market dynamics of Old Fourth Ward real estate. Contact The Keen Team for more information on representation for Old Fourth Ward buyers and sellers. If you're planning the sale of a house in Atlanta, visit our free property evaluation page to find the value of your Old Fourth Ward residence now!